The UsuryFree Eye Opener: The Dynamics of the New Resistance - No Time Left! The Dynamics of the New Resistance - No Time Left! By all accounts time is speeding up and space-time is contracting. As we move further into 2012 this phenomenon is almost palpable. Just where do the hours and days go? Terence McKenna, the late psychedelics-inspired luminary, spoke of an imminent convergence of time-lines that would bring about a ‘singularity’ event: the point where past, present and future become fused into the vibrant chords of the ‘here and now’. Just what might such an event portend? Time is a human invention, a tool for measuring the changing circadian paths of the planets, the phases of the moon, the passage of night and day. It is a useful device, but can easily become the opposite when relied upon too heavily. Indeed, the division of time into hours, minutes and seconds has mostly been used to delineate the financial value of the working day – a far cry from its cosmic origins. 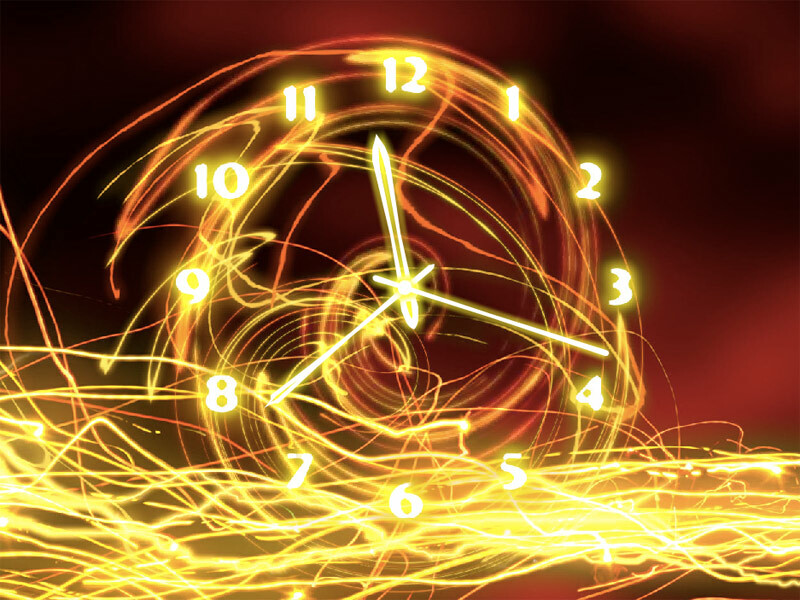 McKenna’s singularity event describes the condensing of all ‘time’ (past events) into an ever more energised and suspended state of ‘presence’. For example, he speaks of the condensing of the last 64 years into just 12 months. A process that captures and passes through to us the vibratory ‘echo’ of significant historical events that have taken place over the intervening decades. As these spiralling time lines pass ever closer to each other at ever shorter intervals, ‘time’ appears to speed up and we are moved ever closer to the ‘simultaneity’ event: an hourglass of tightly swirling energy whose vortex we ultimately pass through, emerging out on the ‘other side’. Now, you don’t pass through a vortex and remain the same person you were when you went in! Such is the dynamic that our vibratory levels resonate at a higher frequency during this passage and at a higher level of consciousness. It is what the Saddhus of India extol their disciples to achieve: the state of “Be Here Now”. Westerners may prefer to call this experience a ‘rights of passage’. Those on this journey will get further support by dint of our planet’s shifting into an alignment with the centre of our Galaxy. All this, you understand, is what I have gleaned (with added poetic licence) from the writings of others more fully versed in these matters than I. However, I find their discourses trigger an intuitive response which connects me up with thousands of others probably having similar experiences and similar observations. Are those of us who share such vibratory signals somehow emerging as a new power on this planet? I believe we are. It is notable that our heightened perceptions are running in tandem with parallel ‘scientific’ lines of enquiry, such as the excitement generated among the scientific community by their probable discovery of what has been termed the ‘Higgs Boson’ (the God particle) at the particle collider centre near Zurich; the revealing of the manifestation of ‘intelligence’ within human cellular tissue in advanced biology circles and the first delineations of the invisible forces that bind the universe* in the field of spiritual/quantum enquiry. What this seems to mean is that we, who go out into the world to confront the forces of destruction that are attempting to take control over our planet, are now being endowed with new powers to fulfill our task. Put another way, we are in an accelerating process of realisation of the potential which has always existed in each one of us to perform what one might term ‘superhuman’ tasks. And let’s face it, the tasks we need to perform are superhuman if we are to wrest back control over our destinies. Those who stand behind the top-down control system and manipulate events with their occult and Masonic practices are aware of the energy changes taking place at this time. They are trying to exploit them for their own ends via such events as the recently concluded London Olympic Games — a veritable coven of occult symbolism. They wish to use such occasions to draw both human and non-human energies towards the realisation of their dark agenda, all the time keeping popular attention on the mundane and surface spectacle of ‘the big show’. Such techniques ensure that any manifestation of deeper truths will be fogged out by the sheer size and intensity of the gladiatorial spectacle. In the case of the London Olympics, billions have demonstrated that they are only too pleased to show their supplication for the ‘greatest show on earth’. Central also to the ongoing agenda is the attempt to foment a major war in the Middle East and beyond. However, the Illuminati manipulators cannot themselves pass through the process of metamorphosis that we are experiencing, and this is their Achilles heel. As we become more conscious and further imbued with higher dimensional awareness, the ambitions of the Illuminati become ever more naked. Their despotic actions being revealed for what they are, highlighted like ink spots on a white canvas. The heightened powers that we experience are the awakening of our own latent potentials. For some this may prove a rather overwhelming experience, especially as it is accompanied by the rapid absorption of a lot of far reaching information which will inevitably contradict previously held assumptions, such as those put about by the world’s mainstream media. To balance out this high voltage information intake it is increasingly important to become properly 'anchored'; our feet well and truly on the ground. Here, gardening, carpentry, bread making, food preparation and manual pursuits of all sorts – yes including the washing-up – should be performed on a regular basis as necessary counterparts to the often heady vibrational load that can otherwise overcome us. This is the time to plot the practical sequence of events that will undermine the Illuminati and ultimately evict them from their pedestals of power. All this energy we are receiving must be turned into practical, pragmatic actions that lead to us wrestling back control of our lives and be used in support of all planetary beings suffering under the cosh of a global dictatorship in the making. Any residual elements of fear associated with taking such steps will be burned off once we come together in various groupings to build 'The New Resistance' and take on our oppressors. As the simultaneity event draws closer, so do we gain clearer and clearer insights into the steps that need to be taken to get this process under way. Already, tens of thousands all over the world are orienting themselves into life situations that will support and be complementary to the new levels of awareness being acquired. I used the term “New Resistance” to describe a situation manifesting itself as 'non compliance' with the dictates of an increasingly authoritarian state. 'Non compliance' in the face of ever more brazen attempts to make us conform to the demands of a corporate cabal and despotic leadership fully intent upon the annihilation of our civil liberties and fundamental rights. All good resistance strategies integrate both the components of ‘defence’ and ‘attack’. The defence of our fundamental needs and the attack that will unseat the Illuminati are to go hand in hand in this coming phase of campaign for an emancipated planet. The new energies and consciousness with which we are being endowed are specifically equipping us for this task. The cosmic timing is impeccable and the Illuminati have no weapons in their arsenal capable of suppressing the rising tide of universal consciousness that is the central ingredient of the deepening year 2012. Our strategic planning for the battle in which we have no alternative other than to become engaged demands concentration, creativity and courage. It is already in movement, and we must expect stiff resistance from those who deeply fear their coming fall from power. All the symptoms are already at play. The almost daily introduction of new forms of oppression; ever more onerous surveillance techniques; unauthorised arrests; false flag dramas; Internet interferences; weather manipulations; the fomenting of new wars; genetic manipulation of the food chain; mind control; depopulation via designed pandemics; banking heists; political and corporate despotism and much more. All tools in the relentless drive to achieve the long-term objectives of a New World Order and absolute control of all arteries of planetary life plus a vastly reduced world population. Sinister it most certainly is. But we have allowed this situation to develop over decades through our passive acquiescence to each turn of the screw. And that is no longer possible. Ultimately, true resistance is born out of the combined elements of a back-against-the-wall finality of the process of retreat, and the timely cosmic alignments that endow humanity with a greater capacity to confront and vanquish its oppressors. That is exactly where we are today. The merging of convergent time lines has brought us to the front line. There can be no turning back. We each have specific roles to play in this drama and these will emerge as we commit ourselves to the cause. There can be no sitting on the fence anymore. The fence itself is collapsing under the dead weight of decades of vacuous human intransigence. Words too. Use them carefully from now on as they carry more and more power. Power to build creative solutions and power to destroy. All this, as the planet itself undergoes geological shifts and transformations of increasing magnitude. Let us remind ourselves that our Earth is a living being and is bound to show symptoms that reflect the predominant human condition. This is not to rule out cosmic influences; Earth is a place which reflects the inter-meshing of cosmic and human influences. It is the lack of comprehension of this fact that has lead to the dissonant dialogues on global warming and the overly simplistic conclusions of a tunnel vision oriented science. Here we see how only a partial answer can come from a partial comprehension. It’s similar to the diagnosis of a Western medical doctor in comparison with that of an Ayurvedic, Chinese or homeopathic practitioner. As we close in on the singularity event, we see the connection between multiple elements and therefore become in an ever stronger position to take action in the process of healing our planet. Here must we all go, for this is a profound truth that has been echoed down the centuries by the wisest minds. For us in the West, it is by pursuing an agenda of ‘voluntary simplicity’ that we can best offer a healing balm to planet Earth and to the overloaded material complexities of our own lives. Even as the Polar ice cap melts and the waters rise; the heartlands of the USA burn to dust; wars rip apart Middle Eastern valleys and mountain tops; earthquakes shatter communities and block vital supplies – our response should remain consistent and answer to the deeper underlying causative agents that lie behind all these events. We must forge ahead with the building of life-supporting ‘Arks’ even as we simultaneously confront the Illuminati bankster gangsters and their corporate accomplices. There is no time to lose. And anyway, time itself is undergoing this profound metamorphosis which is condensing all of history into a whirling vortex of cosmic cleansing and reordering. A reordering so complete that it will ultimately leave us freed of karma and in a place where there is quite literally ‘no time left’. That’s where we are all headed, so drop off your old skin, and face the rising wind with the spirit of the warrior who kindles a flame in the plexus and compassion in the heart. And be prepared to ride out the storm and to come to the aid of those who need your helping hand. This journey is unprecedented; the possibilities infinite. It is we who hold the outcome in our hands. No one else.